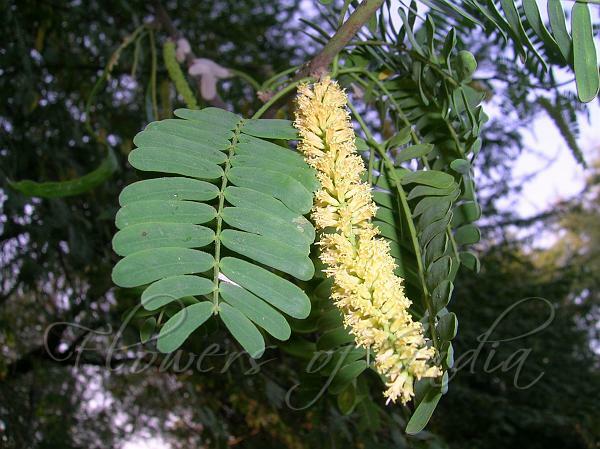 The Mesquite has been introduced in Asia and Africa and is now wide spread in the semi-arid areas of the world. In many areas, it is considered a weed. 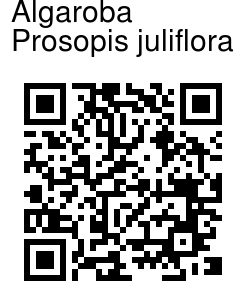 It is a drought resistant small tree, and has been planted in dry areas of Delhi. It is a deciduous thorny shrub or small tree, to 12 m tall; trunk to 1.2 m in diameter, bark thick, brown or blackish, shallowly fissured; leaves compound, commonly many more than 9 pairs, the leaflets are mostly 5–10 mm long, linear-oblong, glabrous, often hairy, commonly rounded at the apex; stipular spines, if any, yellowish, often stout; flowers perfect, greenish-yellow, sweet-scented, spikelike; corolla deeply lobate. Pods several-seeded, strongly compressed when young, thick at maturity, more or less constricted between the seeds, 10–25 cm long, brown or yellowish, 10–30-seeded. Mesquite pods are among the earliest known foods of prehistoric man in the new world. Today flour products made from the pods are still popular, although only sporadically prepared, mostly by Amerindians. Pods are made into gruels, sometimes fermented to make a mesquite wine.